Awesome restaurants compete in best burger contest. Slider-size burgers bursting with flavors, designed for a wide range of tastes and preferences. Custom-crafted burgers that delight and satisfy, made from whole plant ingredients. Just-like-beef burgers, the beefiest, juicy burgers you won’t believe are plant-sourced. Side dishes, desserts, nonalcoholic drinks also for sale. Tickets start at $18 and include burgers, raffle tickets, and all festivities. Nonstop entertainment, raffles, trivia games, magician entertaining in dining areas, live music, music videos, and presentations with dynamic speakers. Upbeat presentations included with registration, with an emcee and dynamic speakers. Be surprised by the captivating joy and benefits of plant-sourced nutrition and why vegan. Sign interpreter for presentation. Food service continues nonstop throughout the event. More Than a Food Fest. Celebrate the goodness of choosing foods that have the least impact on the environment and all of Earth’s inhabitants, and foods that have the best impact on our health and well-being. 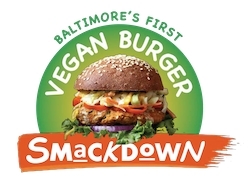 Vegan burgers combine two of the most popular food trends: plant-based dining and burgers. Billions of burgers are consumed in the U.S. every year and the Economist has predicted, “2019 is the Year of the Vegan.” As a healthy alternative to beef, vegan burgers introduce exciting flavors only possible from plant sources. Numerous expert health sources warn us about the risks of consuming red meat; beef burgers often contain meat from hundreds of cows, increasing risk of contamination. Proceeds benefit organizations helping underserved people with access to healthy food: Thrive Baltimore and the Food Empowerment Project, and help support BotaniCuisine’s plant-sourced dining outreach and education efforts.